Human muscles enable movement. When diagnosing or treating sports injuries it is very important to know where muscles attach to the bones, and which movements they generate. If you know where a muscle originates from and inserts into, and which joint actions they make happen then you will know how to stretch and strengthen the muscle, as well as how to assess it for injury. Skeletal muscle is made up of a number of different parts. Muscles are made up of bundles of muscle fibres called fasciculi. 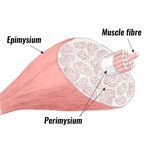 Each muscle fibre is made up of a number of myofibryls. Each myofibril is made up of proteins called actin and myosin. Read more on the structure of skeletal muscle. Sliding filament theory describes at a molecular level how muscles contract. 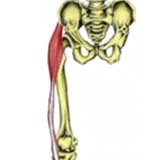 Muscles can contract in different ways depending on the type of movement at the joint. For example, a concentric muscle contraction is when the muscle being contracted shortens (the bicep muscle during a bicep curl exercise. An eccentric muscle contraction is when the muscle lengthens but contracting at the same time (the qudriceps muscles during the downwards phase of a squat). If there is no movement and the muscle is contracted then this is known as an isometric or static contraction. Read more on muscle contraction. The major muscles of the foot and ankle are the Gastrocnemius & Soleus (calf muscles), Peroneus brevis, Peroneus longus, Tibialis posterior, Tibialis anterior, Flexor hallucis longus, flexor digitorum longus, Extensor hallucis longus and the Extensor digitorum longus. The movements generated at the foot and lower leg are plantar flexion (foot points down), dorsi flexion (foot points up), eversion (foot rolls in) and inversion (foot rolls out like an ankle sprain). Read more on foot & ankle muscles. The major human muscles which move the knee joint are known as the quadriceps muscle group, at the front of the thigh consisting of the Rectus femoris, Vastus medialis, Vastus intermedius & Vastus lateralis, and hamstring muscles at the back of the thigh consisting of the Biceps femoris, Semitendinosus and Semimenbranosus. The Gastrocnemius in the lower leg also weakly flexes (bends) the knee. Movements at the knee joint are flexion (bending), extension (straightening) and a small amount of rotation. Read more on knee joint muscles. The hip and pelvic muscles include the Rectus femoris, Iliopsoas (hip flexors), Adductor longus, Adductor magnus, Gracilis, Adductor brevis (adductor muscles), Gluteus maximus, Gluteus medius (gluteal muscles) and the Biceps femoris. These muscles enable flexion (thigh forwards and upwards), hip extension (thigh downwards and backwards), abduction (out to the side), adduction (inwards) and rotation. Read more on hip and pelvic muscles. The spine consists of 24 vertibrae, 7 cervical (neck), 12 thoracic (chest), 5 lumbar (lower back), 5 fused bones of the sacrum and 4 fused bones in the coccyx or tailbone. The main muscles involved in moving the spine and neck are the rectus abdominus, internal and external obliques, quadratus lumborum, multifidus, sternocleidomastoid and errector spinae. Read more on spine muscles. 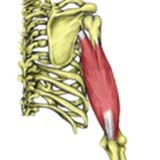 The human muscles of the shoulder joint are the Subscapularis, Infraspinatus, Teres Minor & Teres Major, which are known as the rotator cuff muscles, as well as the Latissimus dorsi, Pectoralis major and Deltoidius muscle. The shoulder joint has a huge range of movement available which is why it is often prone to injury in sport. Read more on shoulder joint muscles. 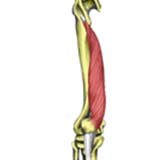 The muscles at the elbow joint include Triceps brachii, Biceps brachii, Brachialis, Brachioradialis, Pronator teres, Anconeus, Supinator and the Pronator quadratus. 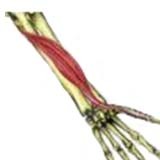 Many of the elbow joint muscles also cross the wrist joint as well. Movements at the elbow joint are flexion and extension, with pronation and supination of the forearm. Read more on elbow joint muscles. Wrist and hand muscles include Extensor carpi radialis brevis, Extensor carpi radialis longus, Extensor carpi ulnaris, Extensor digitorum, Extensor pollicis longus, Felxor carpi radialis, Flexor carpi ulnaris, Flexor digitorum superficialis and Flexor pollicis longus. Read more on wrist and hand muscles. Shoulder girdle consists of the clavicle (collar bone) and the scapula (shoulder blade) which generally move together as a unit. Only the clavicle connects directly to the rest of the skeleton at the sternum bone. 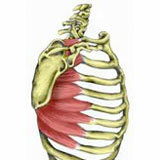 It is really only the scapula which moves from action of the muscles. 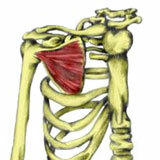 The muscles of the shoulder girdle are serratus anterior, pectoralis minor, levator scapulae, rhomboids and trapezius. 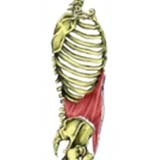 Read more on shoulder girdle muscles.